If you stay very quiet you can watch the critters taking over my little camp area. Well, when I say camp area I mean 'reading nook'. I don't camp. After finishing my book I will head home where there is indoor plumbing and hot water. However, at the moment the critters have the run of the place and I will let them have it. 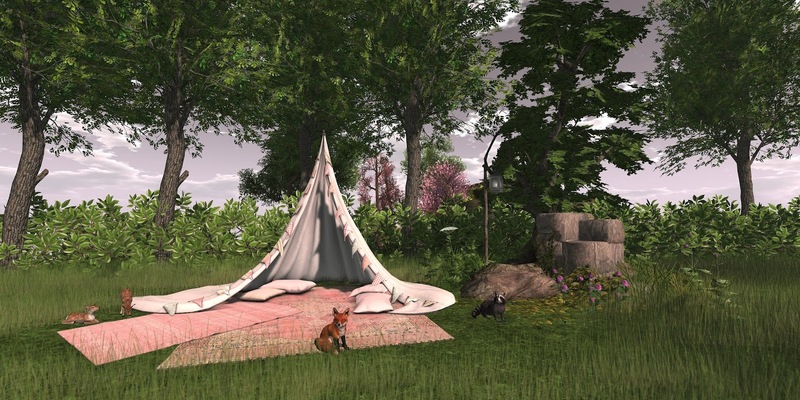 When you have this Boho Tent from CHEZ MOI, you can do whatever you want too. If you want some romance in your life then this is just the thing you need. It comes with 100 animations of you buy the PG version or 168 if you go for the adult version. In both there are animations for singles and couples and there is even a massage selection for really relaxing. To change the texture you have your own hud and can choose from 5 combinations: Sweet Dreams (shown), Calming (black and white), Boho Blue, Earth (brown tones) and Forest. All are gorgeous and you can change your tent to suit your decor or mood. Make sure you go and take a look at Cosmopolitan from Jan 28th to Feb 9th. Next to the tent today is a lovely scene piece from EED Home&Garden and I am honoured to be blogging for this fab store. You will see some other amazing pieces over the next wee while, but today I am showing you 'ROCK w GREENS'. This lovely set comes with 6 animations for the single ladies and 6 for the solo gentlemen. You can enjoy sitting under this lovely tree on the rock and taking in the view. Very relaxing. And, as promised, here are the White Ash trees from Little Branch that I showed you the winter versions of yesterday. Here they are in spring mode and they are gorgeous waving in the light breeze. They are animated and texture change so they work for all seasons. Oh, and the critters and mine and all from Jian.